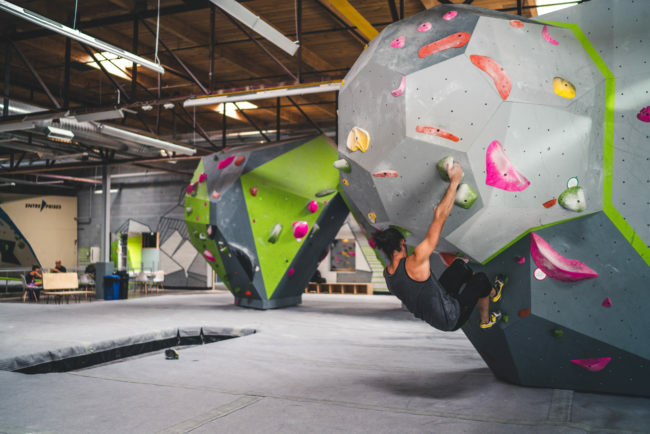 When you walk into Movement Climbing + Fitness’s new all-bouldering facility in the River North (RiNO) district in Denver, the first thing you will see is a field of free-standing boulders inviting you to top them out. Skylights in the factory-style ceiling illuminate gray and lime green Entre-Prises walls that are littered with brightly colored hand holds and enticing problems. What you may not notice at first glance is that different parts of the gym are designed specifically for different styles of climbing. However, Movement Climbing + Fitness only takes up about 39,000 square feet of this 50,000 square foot building. The rest of the space is occupied by Improper City, a multi-faceted company that features a coffee shop that roasts its own beans; a bar with 36 taps serving local beer, wine, and cider; a food truck park and patio; and a co-working space complete with public Wi-fi and a phone booth. What makes this gym unique is more than just the building, it is the experience of going there. A visitor can drop their kids off at daycare, grab a coffee, climb with friends, attend a yoga class, and then answer emails while eating lunch on the patio. Hosting over fifty fitness and yoga classes each week, members and visitors can come for a full exercise routine, not just a climbing workout. Out on the patio, Improper City hosts live music events and art shows. To create such a unique experience, Movement prioritized collaboration on several levels. Movement’s relationship with Improper City is a partnership, where each business runs independently. Mike Moelter, one of Movement’s owners, approached the owners of Improper City and suggested sharing Movement’s new building. The owners toured the space and declared that the business idea would be a home run. But even more unique than the combination climbing gym-and-food-court is the climbing experience itself. 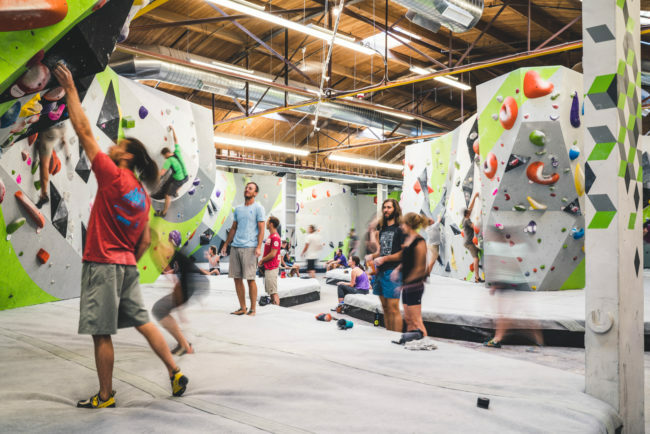 When Ryan Sewell began to think about the layout for the new gym, he had some distinct ideas about how he wanted climbers to interact with the routes. He wrote up a nine page report detailing his ideas and sent it over to Grant Ortman, the wall designer at Entre-Prises. 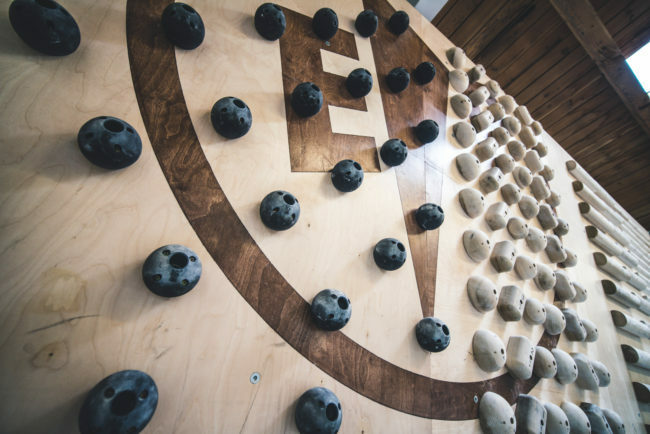 “I worked with Entre-Prises from the very beginning of the climbing wall design to make sure that everything in the space was intentional and that every angle and every wall was geared toward a certain type of experience,” Sewell said. 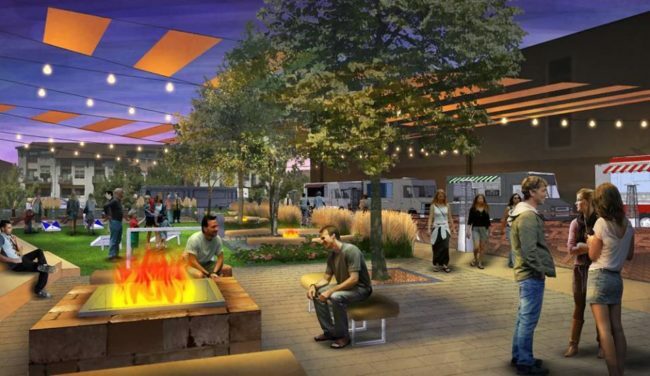 Sewell and Ortman’s plan for the Movement RiNO facility included six different areas, all set in a different style. The first feature that a climber encounters when they walk into the gym is the Field. This area includes free-standing boulders that can be topped out. Many of the routes on these boulders are beginner-friendly, though there are plenty of high level problems as well. “The Field is geared towards the idea of someone experiencing climbing for the first time, and what better way then to climb up something and stand on top of a boulder? It gives that feeling of winning, of ‘I conquered this thing,’” Sewell explained. His hope is that this experience will encourage people to return and climb again. The second area is Brown Town, named because of the distinctive brown color of the wall, which is different than the gray and green of the rest of the gym. Brown Town is set with traverses for people who want to work on endurance and mileage. 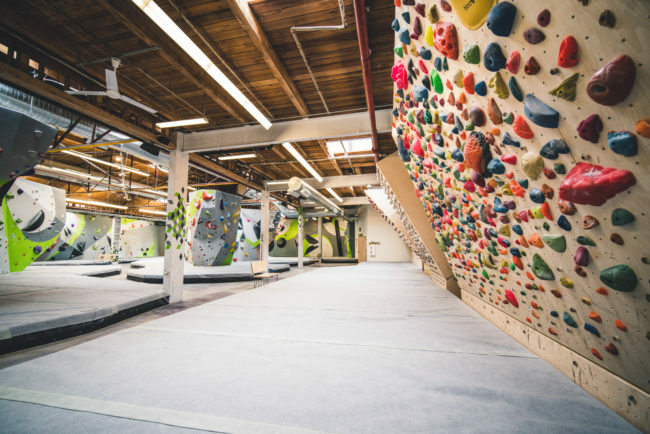 It is also easily sectioned-off for youth team practices so that when the team trains during busy hours, members can be more focused on their training rather than off mingling with other climbers. Next is the Big Cave, one of Movement’s signature features in all of its gyms. This cave has a sloping floor, so as someone climbs higher, the floor stays the same distance away. This allows for climbers to try difficult, steep routes without risking a big drop from the top of the cave. Continuing into the gym, a visitor encounters two more free-standing boulders, known as the South Valley Boulder and North Valley Boulder. Unlike the Field, these large boulders do not have routes that top-out. The problems on these boulders offer a more classic style of climbing and are designed for people who want to climb to get a workout. Around the perimeter of the gym is the World Cup Wall. This wall is set in a competition-oriented style that includes complex, technical moves. There are problems of all grades here, easy to hard, but the style of the problems helps to introduce and advance technique. Finally, there is a Training Wall with a campus board, hydraulic tension board, and hydraulic circuit board wall for those who are following specific training plans or who want to train specific movements. Theses six sections of the gym are set in different styles, but are designed to create a collaborative, interactive experience. The areas are positioned in such a way so that people are likely to have a chance encounter with other climbers or different types of problems, and they will be encouraged to try something new or something more difficult than they would have otherwise tried. Someone can be traversing across Brown Town and see a cool feature in the Field and walk over there to try it. Or a climber can be the North or South Valley boulder and see someone try a difficult move on the World Cup Wall and be enticed to join them. “Working with Entre-Prises enabled us to build the walls with intention,” Sewell said. The thoughtful design of Movement’s RiNO facility—from fitting a full-service gym within the existing architecture of a tin factory, to the concept of six different climbing areas, to sharing the space with a coffee shop and bar—create a completely fresh and well-integrated experience for visitors.